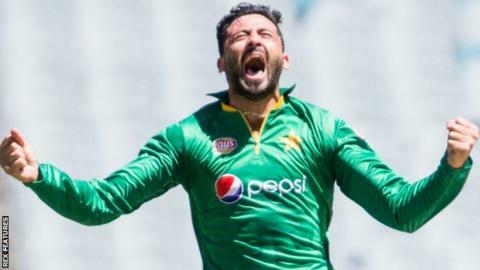 Lancashire Lightning have signed left-arm pace bowler Junaid Khan for this summer's Twenty20 Blast. The Pakistan international helped the Red Rose county reach Finals Day during two previous spells at Old Trafford, in 2011 and 2014. "It would be great to get back there again this year and win some more silverware," the 27-year-old said. Junaid has played 22 Tests, 56 one-day internationals and nine T20 games since making his Pakistan debut in 2011. His best T20 performance for Lancashire was against Birmingham Bears three years ago, when he took 4-12. Junaid, who also played for Middlesex in 2015, will be available for all of Lancashire's group matches and the knockout stages of the competition. "The whole club made me feel incredibly welcome when I played for Lancashire in 2011 and 2014," he added. "The experience I gained in those years has enhanced my ability to swing and seam when bowling." Lancashire head coach Glen Chapple described Junaid as a "very popular member of the squad" who would add experience to the attack. "He should be able to settle in really quickly as he already knows a lot of the squad and his death bowling will be a huge asset for us," he added. Junaid's previous two spells were a great success. He won seven out of his eight appearances in 2011, taking 12 wickets in the process. Three years later he took 19 wickets in 10 games reaching Finals Day on both occasions. As a left-arm fast bowler he can add an extra dimension to Lancashire's attack. He's a fabulous death bowler and has shown he can help defend small totals and help win games.